October 05, 2015 - Rolls-Royce announced the company will invest nearly $600 million to modernize its manufacturing operations in Indianapolis and to conduct technology research, ensuring that Indiana remains a leader in the aerospace industry for decades to come. The modernization plan will enable the company to become more competitive by replacing outdated facilities and accelerating the introduction of new and advanced manufacturing methods. The investment was made possible by the State of Indiana, the City of Indianapolis and the United Auto Workers (UAW) union. Rolls-Royce produces engines for a wide range of military and commercial aircraft, as well as marine propulsion systems. This investment, the largest by Rolls-Royce in the United States since the company bought the former Allison Engine Company in 1995 – will include a major renovation of the existing facilities at Tibbs Avenue and Raymond Street. Upgrades will include new manufacturing and assembly operations that will match the advanced standards already present in many other Rolls-Royce facilities in Indiana and around the world. The five-year modernization plan, which is in-line with the Group’s ongoing investment plans, will also consolidate operations and significantly reduce utility costs. “Our new facility will be a state-of-the-art manufacturing center that combines modern production systems and machinery with a highly skilled workforce. This investment ensures that we can increase our competitiveness in the market, which will benefit both our customers and Rolls-Royce,” said Marion Blakey, President and CEO, Rolls-Royce North America. “We want to express our sincere appreciation to the State of Indiana, the City of Indianapolis, the UAW, and our employees for helping us make this investment in our future possible,” said Phil Burkholder, President of Rolls-Royce Defense Aerospace, North America. “During our long relationship with Rolls-Royce, the UAW has always been committed to being part of the solution for our next century of innovation at our manufacturing operations. This investment, coupled with the most skillful women and men in the world, enables us to be competitive on a global level for decades to come,” said Frank Poynter, Bargaining Unit Chairman, UAW Local 933, Indianapolis. As part of the agreement to make the investment, Rolls-Royce will receive approximately $35 million in State and City incentives. They include conditional tax credits and a skills enhancement grant through the Indiana Economic Development Corporation (IEDC), both of which have been approved by the IEDC Board of Directors. Rolls-Royce and the City have agreed in principle to amend Rolls-Royce’s existing real and personal property tax abatement agreement, and final approval is pending before the Metropolitan Development Commission. All of these incentives apply to the facility investment and technology development that will be incorporated into future Rolls-Royce products. Renovation of the existing buildings will begin immediately. Special project teams are implementing modernization plans while continuing to support our global customer base. For 100 years, Rolls-Royce and its predecessor companies have been engineering, designing and manufacturing advanced technology in the city of Indianapolis. 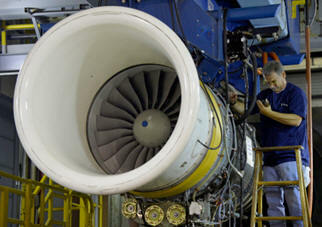 Today, Rolls-Royce employs 4,000 people in Indianapolis, with 1,050 working in production and nearly 1,400 engineers. Economic modeling studies show that aerospace and advanced manufacturing are highly beneficial to local economies, with data showing for every one person employed directly, another two jobs are created in the community – the multiplier effect. Engines designed, assembled and tested at Rolls-Royce in Indianapolis power U.S. Department of Defense aircraft, civil helicopters, regional and business jets, and power systems for U.S. Naval vessels. These include the F-35B Lightning II; C-130J Super Hercules; V-22 Osprey; Global Hawk and Triton UAVs; various commercial helicopters and the new naval Ship-to-Shore Connector program. Rolls-Royce also operates an advanced aerospace technology research and design unit in Indianapolis, which is known as LibertyWorks.